Baby boomers are downsizing, unmarried young adults can’t afford a large home and most often live in small apartments, space, today is a prime commodity. Manufacturers have understood this changing society decades ago and have made space-saving furniture, which are not only functional, but are also attractive and whimsical. Decorating is all about finding the right ornamentation that will offer a comfortable living without sacrificing beauty and function even when one needs to downsize, transition in a new life or moving around from city to city. All my clients need a lot of storage in their furniture, coffee tables and side tables are a few of those items that must have a double function. Sometimes I can design and custom-built some pieces of furniture, sometimes it is simpler to find them in stores and some other times, furniture must be movable. 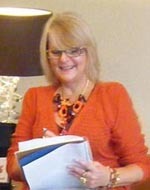 I get to discover so many funky and useful items which meet my clients’ needs and personality. 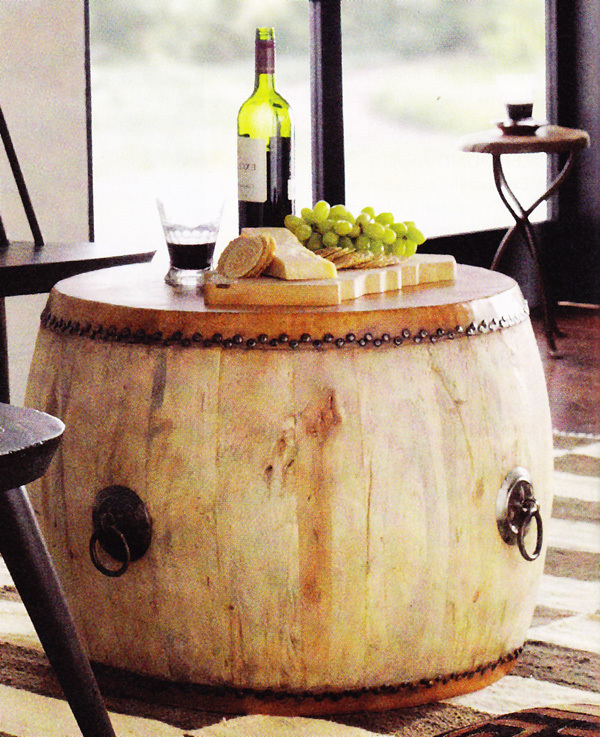 This wine barrel-style side table with leather top is big enough to function even as coffee table. 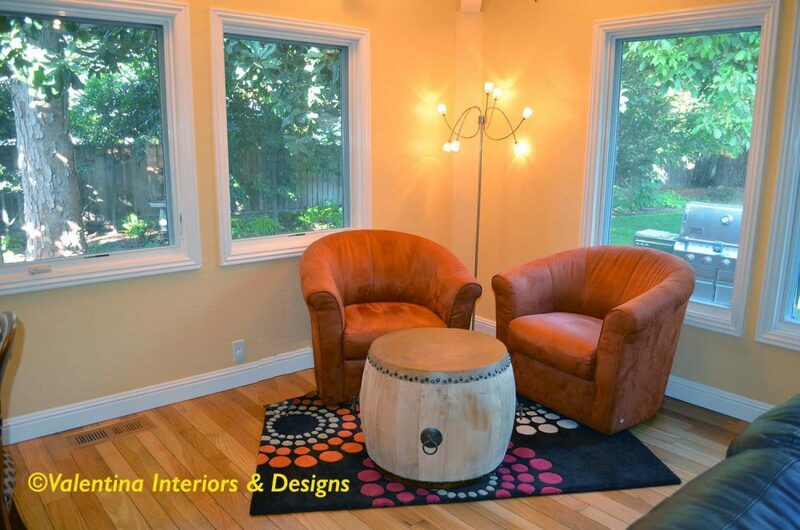 I incorporated this drum table in the conversation corner of colorful family room design. 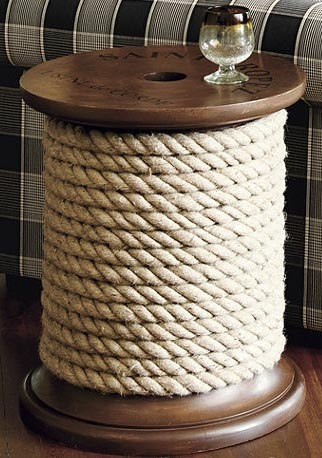 I have used the spool table in a colorful living room, between the love seat and a wing chair by the fireplace. A retro 1950s golden lamp sits on it. 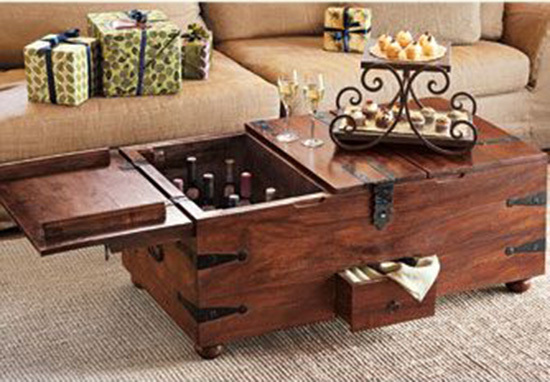 Napa style wine crate coffee table. 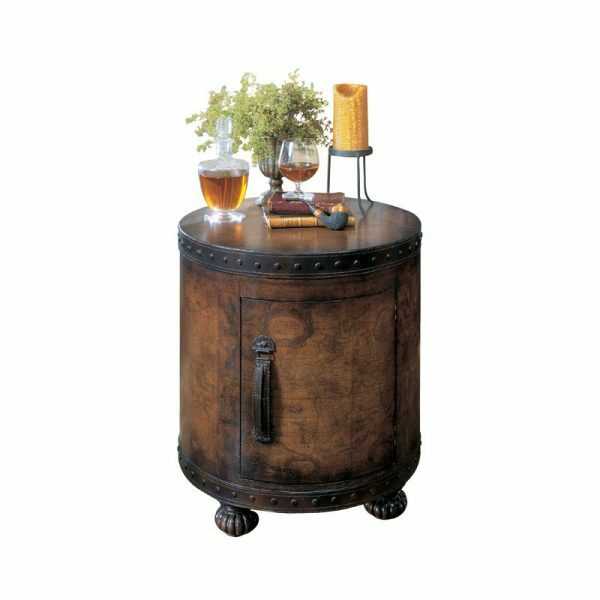 When open, it holds many bottles of wine, wine glasses, a few dessert/appetizers plates and has even a small drawer for cocktail napkins, when it is closed functions as a coffe table. 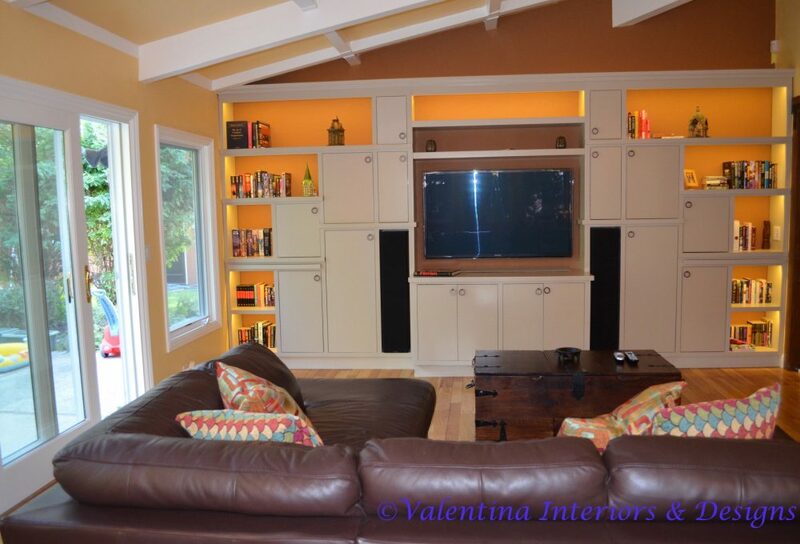 The Napa style wine crate coffee table is here between the custom built-in media unit and the sofa. It will serve as a dining table for the small kids of this house and will hold wines and spirits for the adults. 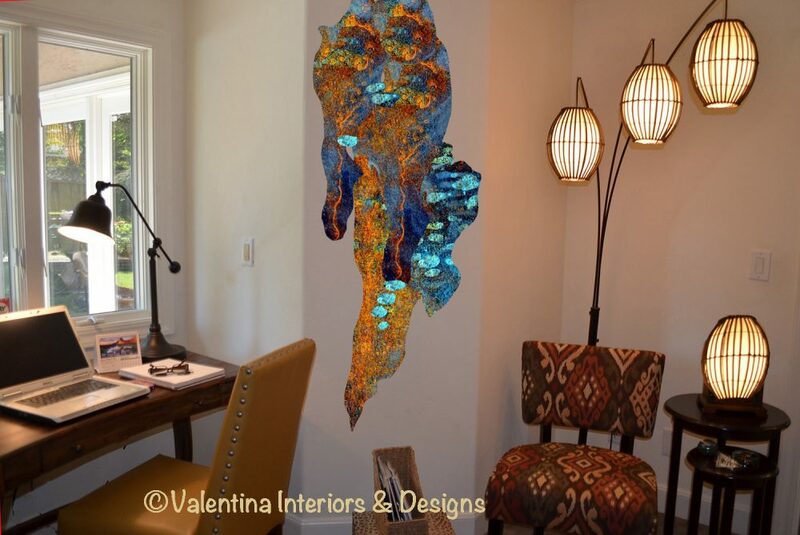 The nesting tables are in this home office next to the Kilim chair under the Japanese rice paper lamp in a very eclectic room décor. 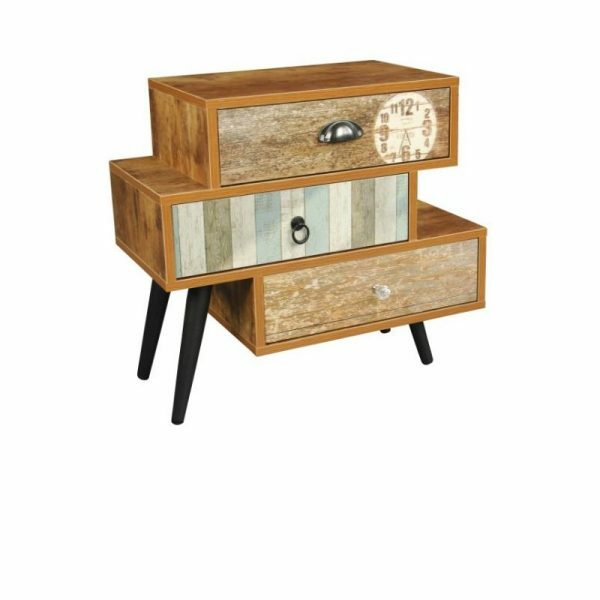 This end table is pretty funky with three drawers going in different directions and a clock printed on the front. It will be included in a retro 1950s décor. 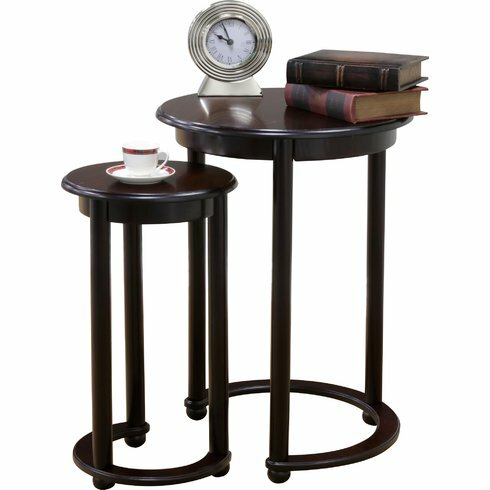 This end table stores bottles of wine and wine glasses, or books and magazines. This is not all. We can choose from tables that can be larger when needed, sofa that become day bed, ottomans with storage, retractable shelves, revolving cabinet units and so much more. 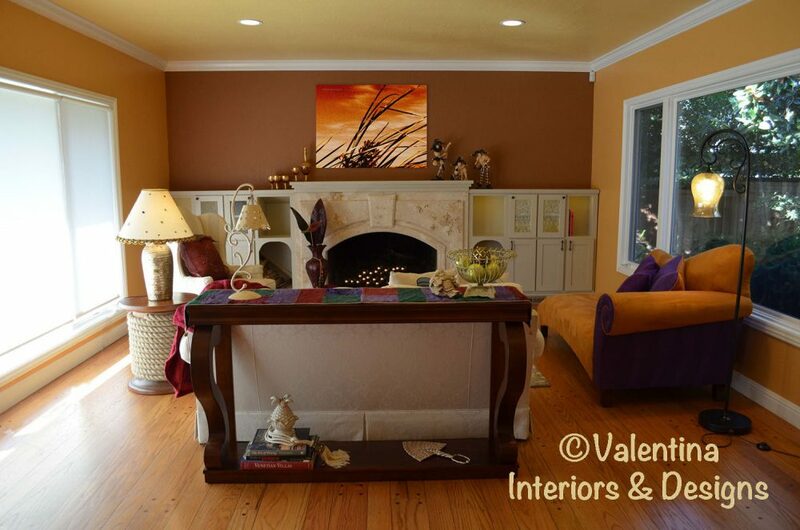 Transitioning in a new space, or a new life is all about prioritizing what is really important to keep or to get rid of, the rest is about creating a pleasing functional life in smaller places and still have an organized harmony. Ciao.